The Differential Association: CCTV: What is it good for? It was the book club's last meeting of 2012, the Xmas Xtravaganza, and we decided to do something different and set an open topic: CCTV. Unrestricted by the concerns of a single article, people brought to the table a variety of questions and perspectives on the topic: Has the advent of CCTV heralded Foucault’s predictions of a panopticon society? Is it a legitimate tool of modern security and a by-product of increased desire for order in a consumer society? Does the rise in CCTV increase feelings of safety or personal anxiety? Why has it become so widely accepted? The topic of CCTV provided scope for an emotive turn in our DA discussion, with some people discovering a previously hidden libertarian! CCTV acts like a probing eye, invading the most mundane of our day-to-day moments, contravening our civil liberties. Conversely, others did not see CCTV as an evolution of something sinister, rather a sidebar in the technological age; a commodity which is perhaps less widespread and effective than realised (see for example the varying levels of competence with which CCTV is actually used). The primary concern of DA members opposed to security cameras related to privacy. Everyone is familiar with embarrassing images of anonymous strangers captured on CCTV which wind-up immortalised on a CCTV show-reel amusing audiences on YouTube or late night TV; what if that was to happen to you? Given the prevalence of these images it is no a wonder that feelings of invasion and humiliation are so closely linked to CCTV. However, surely the device to capture people’s embarrassing moments in this manner is less likely to be peering down from a city corner, and much more likely to be resting innocuously in people’s pockets? The proliferation of the smartphone enables users to capture images and videos of anyone around and within an instant upload it up onto the internet. Moreover, people have few qualms uploading photos from their own life, their own embarrassing moments and nights out on Facebook, Instagram, Twitter, Flickr and any other social website you care to mention. These sites generally don’t just contain images, comments, dates and details of other people, but also personal information like date of birth, relationship status and even current location. Is it duplicitous to be so vehemently opposed to CCTV while giving out more personal data than a security camera could ever capture? Viewed this way, is the sting taken out of the idea of CCTV as personal invasion? The voluntary nature of people's usage of these sites is of course the counter-argument. Perhaps it is because great swathes of people now have so much control over their image that it feels like an even greater impropriety when it is taken out of their hands. It was suggested that the idea of privacy of movement and action in a public space is a paradox worthy of Catch-22, however. In the end some people proposed that rather than right to privacy, the use of CCTV images could be restrained by stringent data protection laws, making company’s liable for the uploading of images on the internet. For those of us DA members who viewed the CCTV threat as something shadowy, unproven and verging on the mythic, are we blithely ignoring the realities? In order for CCTV images to remain private, there is a long chain of actors, each of whom must conform to various conditions, complying with guidelines and regulations each in their turn. It is a succession of 'ifs'. The difference, too, between a surveillance network controlled by the state, and those under private control, are pertinent. The reduced options for redress when the operator of the CCTV system is a private company make the use of corporate and private CCTV and the storage of data a pressing issue. The state is taking tentative steps to address the issue of privately-operated CCTV by re-examining the provisions of the 2006 Privacy Bill. In light of the expansion of private surveillance, Minister for Justice Alan Shatter has pledged a review of the Bill in order to safeguard the privacy of individuals (for a discussion of the issue see here). It may be insightful to tease out some of the popular and opposing feelings about CCTV, those with more apathetic responses as well as the visceral sense of wrong felt by others. Are the more apathetic among us simply more accepting of the new ‘criminologies of everyday life’? Is it naïve to not see this as something more insidious, the responsbilization of civil society; the wider acceptance of the criminal as a rational opportunist? Does this position ignore or underplay the serious risk of destabilising social cohesion and increase state-scepticism in favour of mass individualisation and devolution of crime prevention? Popular ideas of CCTV are often connected to Orwellian prophesies of oppressive state power, yet if the above is the case then the growth of CCTV is actually connected to weakening state control and the awareness that the state on its own is inadequate to tackle the challenge of crime. 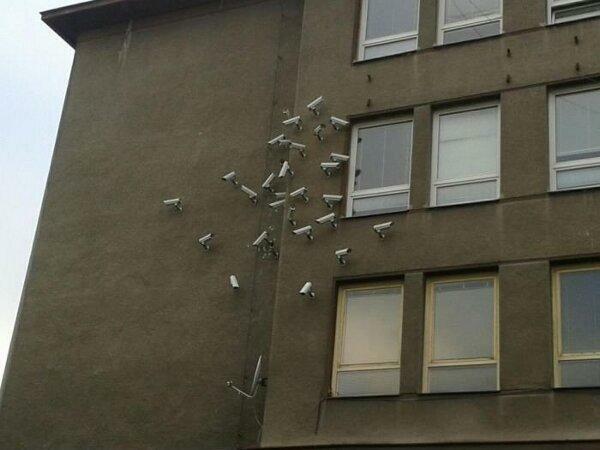 Contrastingly, there are those who are affronted by CCTV. Is it possible that some people are not used to the 24-hour glare of surveillance; being made to feel like a potential threat? Perhaps for some the spread of CCTV uncomfortably blurs the line between us and them, the suspect population. Is it that many people in fact don’t want CCTV to fall out of use, but instead have it focused on those who are seen as deviant? Or does the use of CCTV create the deviant population? as such, could the increased use of security surveillance in certain space entail a deepening of the trenches between various social groups? Outside the urban and commercial settings, it would be illuminating to know what the use of CCTV in residential areas represents to the people in these communities. Do they feel their privacy is undermined, or does the use of cameras increase a sense of safety? Interestingly, some commentators have suggested that widespread use of CCTV actually tends to undermine natural surveillance, thereby perhaps scoring an own goal for crime prevention. No one happened across any research which explored these questions (of course that doesn’t mean such research doesn’t exist!). We felt there was a strong case for greater analytical focus to be spent exploring the increased use of surveillance technology. Perhaps, criminologically, the focus on CCTV is more spread out, it is only one node along a widening continuum of technologies of security. Furthermore, among some scholars the increased use of everyday security is considered one of the indices of changing modes of governance and an acceptance that the state has a limited capacity to address crime. As such, CCTV doesn't get, or maybe need its own solo analytical outing. Several DA members were impressed by the work of Goold et al, which off-loaded some of the emotional and moral weight of this topic exploring the rise of security devices through a sociology of consumption framework. They describe CCTV as a common-place good, something uncontroversial and ubiquitous. Interviewing buyers of security goods, as well as those who work in the security business, the initial findings suggest that rather than people gaining a sense of order, power and safety, buying security feels less like an act of fulfilment and more like a ‘de facto taxation’; a nuisance and an irritant. There was some evidence that CCTV does have an impact on criminal activity. For example, the Campbell Collaboration in 2008 reported that CCTV did have a 'modest but significant desirable effect.' However, it was most effective when used in very specific circumstances, namely as a means of reducing car crime in car-parks. The results supported the continued use of CCTV, but in a narrow, more targeted, fashion. Considering that CCTV is the single most heavily funded crime prevention method employed in the United Kingdom (where the study was carried out), such advice would seem to herald a chance for money-saving opportunities. However, there seems to be no sign of innovating the recommended targeted use of the technology. Yet the promise of CCTV and the political gain attendant on this remains a political given. As such the rise of surveillance seems set to continue for the foreseeable future. Perhaps it is simply the case that CCTV is more for fear of crime than crime itself. Does the presence of CCTV itself act as a cause of anxiety? This was one of the keenest questions posed by the DA and one to which we could find no answer. CCTV acts as an external sign of action, politicians can be seen to be doing something. This was held as one of the most immediate causes of the number of cameras on our streets, this combined with a general lack of understanding on the scope of what such methods can actually achieve. In practical terms CCTV appears to be quite specious at best. However, we found this topic to have more depth than it appears, and like all good debates we didn’t all quite agree in the end about what the rising use of CCTV means and what its practical and symbolic functions were. To understand its rise and subsequent acceptance it is best understood in wider political or cultural framework. This month's blog was written by Louise Brangan and Lynsey Black. And I agree with you that everyone should install CCTV system at their home or at the business place. Company is providing the best Security system installation in Hamilton at reasonable cost. SAV Design also provides the Access Control, Gate Automation & Control and much more things. thanks for visiting your blog, keep posting. provide professional and well experienced securty guards. CCTV camera's are technology through which you can always put an eye at your home or at your work space even when you are far away. But installation of CCTV are must be done by professional of security service provider company to ensure better quality. I think having CCTV security camera is a very good idea to stop crime because burglars and thieves hesitate to break inside a house or public place that is furnished with a CCTV camera systems. CCTV Installation on long Building are good to see. Thanks for sharing this post. It is important to install Security Cameras and keep the total workstation premise under CCTV Surveillance. You can even initiate the Video Surveillance Systems in the office, which will keep a watch on the workflow of your office staffs even. Thank you so much for sharing such a useful concept. Amazing and appreciable blog. The locksmith organizations are fundamental! If you wanna your home be genuinely shielded you have to manage your locks. Thank you very much for sharing this awesome post. I will visit again to read more post. The Locksmith Brisbane organisations are fundamental! If you wanna your home be really shielded you have to manage your locks. Found your blog. Its really nice on security products. I appreciate your article. Its important to get quality security products. So thanks for sharing all that important information. Thanks for sharing this kind of useful information zicom offers best advance home security. CCTV security camera is best technology product which keeps your home and office safe. So by using professional security service provider you can ensure for best quality. Cpplus is a leading Supplier of CCTV Camera , for More Information Visit above link. Great collection. Keep sharing..!! buy Security Cameras by shipgig. Useful and informative blog..!! Buy Security Camera from shipgig. very useful information you have shared on a blog.I like it.Digital Video Recorder in Ahmedabadkeep it up. This Blog is nice and content information is useful for security. I think you can have provided more information for CCTV security camera so please share with us. Thanks for sharing. Please keep blogging up. Its awesome blog Keep sharing..!! Great collection of security cameras by shipgig. Here is many good things about cctv camera and other security camera which i never read or heard before. Thanks for this info. Livfuture is best Boom barrier manufacturers in pune. Boom barrier is part of parking management system, barrier gates stops unauthorized parkers entering your premises, or giving access to authorized parkers. With the Skyrocket growth of technology CCTV cameras play a vital role in today's digital world. cctv is very usefull for your security purpose. A car alarm system is an electronic device installed in a vehicle in an attempt to discourage theft of the like OEM alarms, aftermarket systems are usually armed and disarmed via remote. Rất nhiều đơn vị lắp đặt camera hà nội uy tín. Tuy nhiên, Bảo An CCTV vẫn là đơn vị hàng đầu và tốt nhất. You post and content is really nice. Keep posting these kinds of stuff to motivate people. But, we need to add some more points on security here. As we more focus on child safety and security, so to make your child safe and secure at home, you guys must install security camera , so you can regularly monitor on your child. Thanks for posting this blog, i am very impressed with your blog and it is very useful for me and other. Please visit at "CCTV Cameras systems In Uk - Media Trix", i hope it be prove useful for you. sua camera da nang lắp camera an ninh tại đà nẵng camera không dây đà nẵng camera an ninh tại đà nẵng thiết bị chống trộm tại đà nẵng lắp đặt camera quan sát tại đà nẵng camera ip tại đà nẵng. Sua camera tai da nang công ty lắp đặt camera tại đà nẵng camera giá rẻ tại đà nẵng sua camera da nang bán camera tại đà nẵng lắp đặt camera ở đà nẵng lắp đặt camera đà nẵng bán camera ip tại đà nẵng bán camera ip wifi tại đà nẵng. This is very nice information about the CCTV Camera Services. Thank you so much for sharing your knowledge. Keep it. Tocvue Technology (HK) Limited is a professional Retail security display system supplier we are also dealing with Standalone Security Display Stand .Wholesale OEM/ODM .Contact；andy@tocvue.com for more info. Get CCTV Camera price, Credible Technology BD are the best CCTV camera company in Bangladesh. We are CC Camera solution provider in Dhaka, Bangladesh. Hire us for your CCTV Camera installation as wireless security camera systems, best outdoor wireless security camera system with DVR, CCTV Camera types are Dome CCTV Camera, Bullet CCTV Camera, etc. First of all, Please allow us to introduce us, we Credible Technology BD is a It embed Digital security solution provider based in Dhaka,Bangladesh. Since 2002 we are in this business & still continuing with full satisfaction of the valued clients. We are offering the best CCTV Cameras price by all renowned CCTV cameras brands & affordable price in Bangladesh. Select us to quote you best Security solutions price by Dahua CCTV Cameras, jovision IP Camera, Hikvision Camera for IP Camera, Dome camera, Bullet Camera, PTZ Camera, Security cameras, Wifi camera, Spy camera & wireless camera Price in Bangladesh. We Credible Technology BD is a It embed Digital security solution provider based in Dhaka,Bangladesh. We are in this business since 2002 to still continuing with full satisfaction of the valued clients. * Expert technical team (Local & overseas) Online / Offline facility. * Product deliver : X factory to buyer premises facility. * One year free service & warranty. Check CCTV Camera price list here. Domestic CCTV cameras can be installed at a cheap price and you can improve the security at your home. Always check for the image quality and the best place to fix the camera. Your camera can be wired or wireless if you go for wireless camera there will be chance of footage loss during bad internet connection but wireless cameras are bit costly. A well placed security camera can keep your house out of criminal sight. It also helps the police to identify the criminals. Lookig for CCTV Camera Company in Guwahati ,SM Infotech provides you best service for all security system at your home /office . The blog is written very creatively thanks for sharing your views with us. I found your blog very informative and useful. Thanks for sharing with us. This is a nice blog, it helped me a lot. Thanks for sharing useful information.